The impact of mobile technologies on the world is reminiscent of the changes brought about by the industrial revolution and the e-business revolution. In a very short period of time, mobile has become the predominant form of communication between people. The prevalence and reach of mobile continues to increase with the number of mobile connected devices expected to exceed 10 billion by 20181 and with recent studies finding that the average mobile phone user checks his phone 150 times per day.2 Mobile provides professionals at organizations the ability to interact with more people, more often than ever before. But while individuals have embraced mobile; many businesses find it difficult to incorporate mobile solutions into their organization to drive value. Leaders at organizations are quickly learning that creating a few new slick applications does not guarantee success in the digital economy. 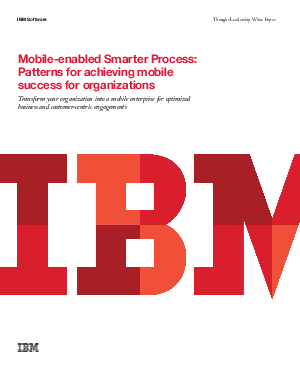 Mobile business is about reorganizing your enterprise around mobile technologies and reinventing your business processes to fundamentally change how your organization operates.